Okay Meera now that we have you here we want the tooth, the whole tooth and nothing but the tooth! - I think she fainted doctor. Yesterday was my long awaited six month teeth cleaning. 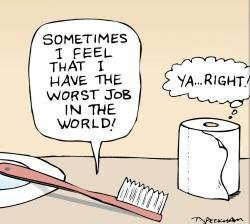 My hygienist is an amazingly nice person, but I still dread it. I naturally attract plaque, a gift I would happily give up, and do not have the strong flossing routine in place to keep it at bay. As well, the ultra sonic device that would make quick work of it is a problem for me. So it all has to be done old school - by hand. We talked for a brief bit to catch up before she started. Then settling down to get the job done, I opened my mouth. Her first words were, "Why don't you write a blog about what your hygienist wants you to be doing." So in honour of her patience and hard work, here it is!!! 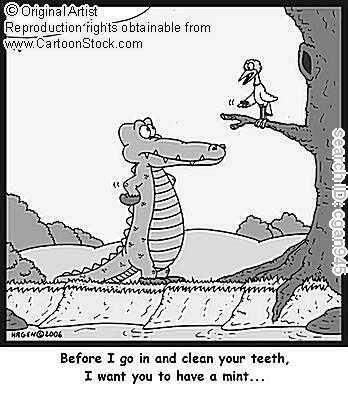 I still remember my first dental appointment. The fact I remember it lets me know I wasn't super young, but I had to have eight fillings. From day one the sound of the drill was like fingers on a chalkboard in my ears. There are two responses one could have to this experience. One, you become fanatical about your teeth and clean them constantly or two, you develop an aversion to anything to do with your teeth. Like most dental-phobes I chose the self-destructive second choice. 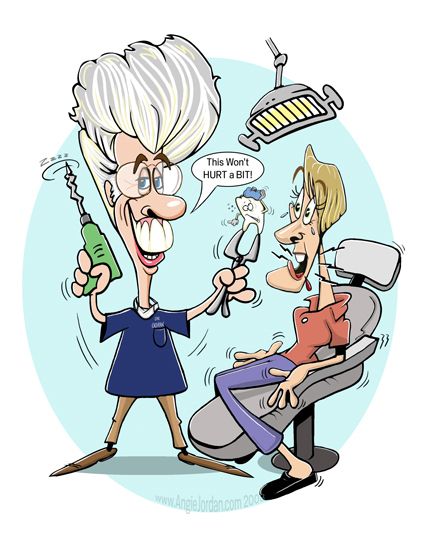 Even going to get my teeth cleaned required a huge effort and any necessary drilling caused great anxiety. One dentist used happy gas which did relax me, but the down side is that you cannot drive home and as I have been on my own since I was 17, it just wasn't often an option. I was very fortunate when I moved to Richmond to luck into a wonderful female dentist who was very patient and helped me understand some what I was experiencing. For anyone with a musical ear, the pitch of the drill can be a problem. She had several symphony members who struggled the same way and, as the sound travels through bones, head phones really don't do more than take the edge off. In paying attention, I realized drilling on the top was more disturbing because of this so I had to come more mentally prepared than when I had a cavity on the bottom. My theory is to play dead so the dentist can do their job as quickly as possible. I just lay still in the chair and don`t move or talk. It's an exercise in self control and makes it appear that I'm not ready to run out of the office screaming, which is actually the case. In my head I do the multiplication tables, count back from 100 and try to write articles. If it really gets to me I push my fingernails into my palms to create a little pain to distract me. Only two times have I ever panicked in the chair - both times because the dentist had a struggle getting the tooth numbed. When it's over I smile, walk out to my car and then fall apart in private. Not very adult. 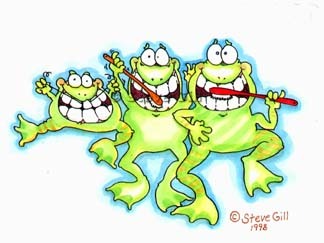 Fortunately I`m not quite so crazy when I get my teeth cleaned, although I still struggle, and can be more responsive. When this dentist had to unexpectedly retire for medical reasons it threw me for a loop. Fortunately I found a new office that had that same wonderful feeling and patience with my problem. My hygienist keeps working with me to improve my routine. What I love about her is that she continues to try and find a way to work it into my life that will stick. Instead of just dictating where and when I need to brush and floss, she keeps making small changes in her suggestions that are guided by the feedback I give her. Last time it wasn't to worry about what time a day I flossed and brushed, just to do twice where every it fit in. This was a very freeing conept and worked quite well up until my life hit a crazy time, then I was back to square one. She had a new idea yesterday I'm going to try. Put a soft toothbrush and package a floss by the computer and where you sit to watch the TV, no toothpaste needed. Just floss and then use the toothbrush to gently massage the gums. You still need to do that good brushing, but it's one of those creative solutions that might at least get me on track with the flossing routine I need to establish. I have no idea if this will totally solve the problem, but improvement is the goal here - baby steps. If I can come up with a routine that fits into my crazy life, it will stick. Then maybe those six month cleanings will be a little less stressful for both of us. So to my hygienist, here it is with my thanks for your patience, I know I am a frustrating patient for you. A little boy was taken to the dentist. It was discovered that he had a cavity that would have to be filled. "Now, young man," asked the dentist, "what kind of filling would you like for that tooth?" At 5 P.M. one Halloween afternoon, my dental hygienist realized that she wouldn't make it to the store in time to get snacks for trick-or-treaters. So she took home some free samples from the office supply cabinet. That night she handed out dozens of toothbrushes, toothpaste, and dental floss. The next year, although she had bags of chips and popcorn, not one child came knocking at her door.